If your team is a part of the over eight million daily active users of Slack, the TINYpulse integration is definitely for you! Enable survey delivery to let employees respond to their pulse directly in Slack, connect the Wins feed to increase visibility of your efforts, and bring recognition to the forefront of your organization with a dedicated channel for Cheers. Setup only takes a few minutes so your Slack integration with TINYpulse will be rockin’ and rollin’ before you know it. Note: You must be an TINYpulse Engage Admin or a Super Admin in order to complete the configuration. Engage Segment Admins don't have access to the Apps section, so please speak with an Admin/Super Admin to assist. You'll also need to be a Slack admin, otherwise you'll get an error which is a bummer. 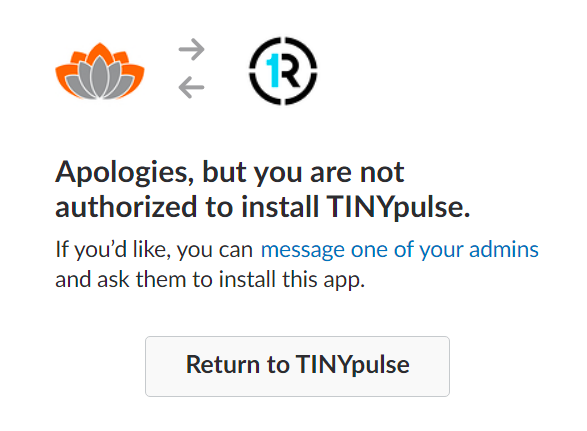 Please speak to your friendly TINYpulse and Slack administrators if you have questions. The TINYpulse for Slack integration has three main features. Want higher response rates and better engagement with TINYpulse? TINYpulse has a bot to send your employees their regular pulse survey directly to their Slack app. Once you enable the configuration, the TINYpulse-bot will let employees know when they have a new survey ready and they can anonymously respond without even having to visit TINYpulse. As employees are submitting feedback to TINYpulse and you're taking action to address these items, are you keeping employees in the loop? The Wins feed for Slack improves visibility and transparency tenfold by streaming suggestions, initiatives, and Wins directly to Slack for everyone to view and add their thoughts with a comment. And any comments on these items that are posted from Slack are also recorded in TINYpulse so the conversation isn't lost. Note that anonymous suggestions are only sent to the Slack Wins feed if the Stream anonymous suggestion to the LIVEpulse feed option is enabled in Settings. If this option is disabled, employees can't see suggestions anywhere unless you choose to share them in a summary report. Another option to boost engagement and recognition is to stream your Cheers to a dedicated Slack channel. Employees can interact by adding their comments and emojis, continuing to spread sunshine throughout your organization. Comments are even posted to the original Cheers in TINYpulse so the receiver collects even more recognition for their efforts. The first step in setting started is to connect your Slack workspace with TINYpulse. From there, you can enable survey delivery, the Wins feed, and / or the Cheers feed as you like, but this first step is a must. 2. Find Slack in the list, click to open the configuration page, and select Connect. 3. Slack will verify your email address and request access to TINYpulse. From here, a list will automatically appear with all Slack teams that you belong to. Authorize the default team or click Change Teams to add a different one. You've now enabled TINYpulse to access your company's Slack team, but you still have a few more steps to take to enable different functionality. After you've allowed TINYpulse Engage to access your Slack team (above), you'll see the Slack is now connected in the Settings -> Apps section of Engage. Follow these steps to allow the TINYpulse-bot to notify employees when there's a new survey and let them respond directly in Slack. From the configuration page in Users and Settings ->Apps -> Slack, click the dropdown list and select TINYpulse-bot. 2. Click Add and you're done. Employees will now be notified by the TINYpulse-bot when the next survey becomes available depending on your timezone and survey cadence. * Note that if you integrated Slack with TINYpulse before August 2018, you'll have to disconnect the integration and then reenable it following steps in the two sections above. Remember that the Wins feed is a live stream of anonymous suggestions, initiatives, and Wins to Slack, where employees can add their comments which post to TINYpulse. Now that you've got the gist of it, here's how to set it up! Before you start, you'll need to think about where to stream these items. While you can stream the Wins feed to any one of your public Slack channels like #general or #random, we recommend you create a new one specifically for this integration. Some options to get you thinking are TINYpulse, TINYpulse-feed, TINYfeed, etc. So go on and make that decision, create a new public channel in Slack if needed, and let's get started. Select Wins Feed from the dropdown list. Choose the Slack channel for this live-feed. And that's all there is to it! If you created a new channel, don't forget to notify employees that they'll need to join because there isn't an automatic notification for this integration. The last option for ultra TINYpulse engagement is the real-time Cheers feed. Since Cheers is likely to be the most frequently used TINYpulse feature in your org, we recommend setting up a fully dedicated channel for just Cheers. We don't think it's a great idea to use the same channel that you used for the Wins Feed because those items could get drowned out by Cheers, but it's completely up to you. Similar to the Wins feed, configuration takes 30 seconds or less. Head on over to your Slack feed and you'll now see Cheers rolling in for everyone's viewing pleasure. Pin Cheers, add reactions, and comment directly in the channel to further recognize the Cheers recipient. You can still take advantage of this integration if your company is broken down into multiple TINYpulse orgs but share one single Slack workspace. From each TINYpulse org, just follow the steps above to configure TINYpulse for Slack, enable survey delivery, and set up a real-time Cheers feed. Note that this configuration must be done individually in TINYpulse for each org. Apologies for the tedium, but we promise it will be worth the small effort! We at TINYpulse love Slack as much as you, but there are a few limitations to this integration depending on how your Slack and TINYpulse accounts are configured. Please reach out to our support team if you're facing one of these limitations. We always love hearing from our customers, so let us know and we'll consider adding your request to our product roadmap! This integration allows for multiple TINYpulse orgs to connect to one Slack workspace, but doesn't allow users to respond to multiple surveys from multiple orgs while connected to one workspace. So if you meet all three of these criteria, creating aSlack perfect storm, you cannot respond to any of your TINYpulse surveys via Slack. Please visit the TINYpulse web application to continue responding to your pulses. If teams at your organization live in multiple Slack workspaces and in one TINYpulse organization, you will not be able to enable survey delivery to those multiple workspaces. TINYpulse is only able to integrate with one Slack workspace at this time.